One protest called for jokes, the other demanded justice as two very different demonstrations took place in Sydney yesterday as activists voiced their dissent before this week’s state visits by the Chinese and American presidents. Between musical acts, a parade of grim-reaper puppets and a “fall-into-line dance” featuring dancers in cowboy outfits, speakers addressed issues such as the war in Iraq and a proposed Australian-American free trade agreement. 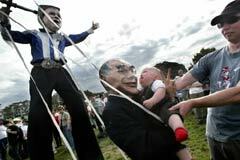 Sharan Burrow, president of the ACTU, said the mix of humour and entertainment helped draw people to the park, and let organisers “get the message out in different ways that interest people”. Some of the biggest cheers came with criticisms of the Prime Minister, John Howard, by Andrew Wilkie, the former Office of National Assessments analyst who quit in protest over the war. The message was serious, but humour was never far away. The tone was very different in front of the Chinese consulate, where earlier in the day impassioned speeches and a march into Chinatown highlighted the “Bring Jiang to Justice” rally. The protesters hope to put former Chinese president Jiang Zemin on trial for alleged human rights abuses during his time in office, including persecution against political dissidents and religious groups. Hu Jintao replaced Mr Jiang as president last year, but protesters said the former leader should be brought to trial internationally for attempted genocide, citing the prosecutions of former leaders Augusto Pinochet and Slobodan Milosevic. Organiser David Rubacek said Australia could improve Chinese conditions by linking trade deals to human rights standards. He cited the influence of MPs and activists in the defeat of an amendment that would have weakened freedoms in Hong Kong.